Fall is one of the most magical times to be on the water, and what better place to be than in the Texas Hill Country! Bass will be feeding vigorously on larger prey in preparation for winter’s arrival and the slowing of their metabolisms. Sunfish will also be very opportunistic, looking for any hapless insect that crosses their path. It is the job of the fly angler to be in the right place at the right time, with the right fly, and the correct presentation. For the purpose of being concise, I will simplify and explain each main topic so that you will spend more time actually fishing, and less time reading about it! 1. Right Place(s): In the fall season, just as in other seasons, bass will use cover such as branches, logs, vegetation, and rock piles for ambush points. Look for visible cover to present flies through and around, such as weed lines, rock ledges, fallen trees, log jams, and even current seams. Many people forget to include current seams (where a fast current and a slower current meet) as a legitimate form of fish cover – don’t be one of those people! Simply put: Think edges. If you see an edge, fish it! Underwater rock ledges and steep mud banks also hold significant value during this time of year, and here is one of the reasons why: Warmwater species such as bass and sunfish do not particularly care for cold fronts, due not only to lower water and air temps, but also to the high barometric pressure that immediately follows a cold front. The mix of high pressure, cold air, and cold water is truly an unfortunate one for southern fly anglers. However, vertical structure such as underwater ledges and high, steep river banks allow fish the opportunity to stay shallow to feed on prey items when the weather is ideal, and upon the arrival of an arctic front, retreat into deeper haunts where water temps stay more consistent. Think Edges. 2. Right Time(s): Fall can yield the full spectrum of weather that Texas has to offer! From blazing hot days to freezing temperatures at night, a Texas fall can show you these and everything in between! Watch the daytime “low” temperatures when you look at a weather forecast. 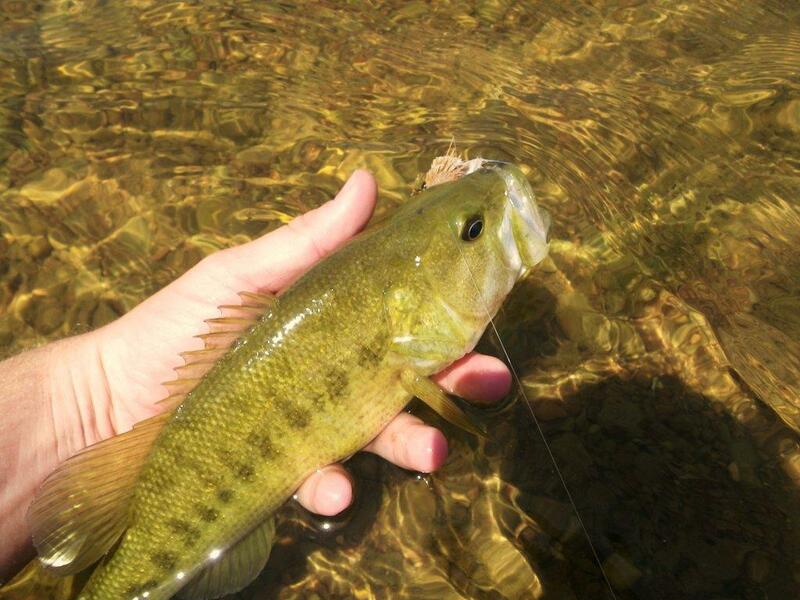 If you see warm days with smaller high to low temperature swings, then prepare for great fall fishing. For instance: If you are fishing on a day where the high temp is forecasted to be around 76 degrees and the previous night time low was in the mid 60’s, you can expect fish to be reasonably active! However, if you see a forecasted high of 76 but the previous night time low was in the mid to low 40’s, you might wait for the sun to warm up the water a bit before you venture out. Now, this isn’t a rule because if it was, then there would be exceptions to it! Think of it more as a guideline. To simplify the whole “right time” point, allow me to put it this way: Always fish in front of a cold front if possible! The approaching front causes barometric pressure to drop and stimulates a brief, pre-frontal feeding frenzy! In the event that you are fishing after a cold front, fish deeper water in the cooler parts of the day and if the sun comes out, then try fishing the shallows for fish sunning themselves. Once again fish the edges! Fish want to travel the least amount of distance for the greatest amount of comfort and food. •	Baitfish – Glades Minnow, Matt’s Llano Critter, Brushy Creek Streamer. •	Terrestrials – Chris’s Fluff Beast, Morrish’s Hopper, Jim’s Llanolope, and a good Deer Hair Bass Bug/Diver such as Umpqua’s Swimming Frog. 4. Right Presentation(s): Once again, this can be a very extensive topic but there are some basic rules to live and fish by! Cold water equals deep, lethargic fish; therefore, you will need a slower presentation and sometimes will be required to cast a sinking line. Torture, I know, but well worth the effort. However, this is by no means a reason to despair! Believe it or not, I have finally found a sinking line that is well suited for our rivers, and is actually a joy to cast. Downcast, disparaging, sinking -line-casting fly angler…meet the Rio Streamer Tip! This line has a slow sinking, clear tip that is perfect for a slow sinking presentation against steep banks and rock ledges. It’s a great line to swing a streamer with as well! I have found this line to be invaluable when fishing streamers to fish holding just out of the reach of a floating line! Once again, there are other lines produced by many wonderful manufacturers that accomplish the same thing, the previously mentioned line is simply my personal favorite. Now, not all fall fishing is done slowly, deeply, and methodically with a sinking line. As a matter of fact, most of my fishing is done wish a floating line. Warmer air and water temps will trigger active fish into feeding aggressively! It is almost like bass know that they will get to relentlessly murder a hair bug only a few more times before the onset of winter! Don’t leave your topwaters at home! You can search a lot of water on warm days by fishing the surface, and if the fish are not agreeable simply put on a subsurface pattern and fish likely fall habitat (see topic #2 above) to locate fish! Let the fish tell you what they want! After all, they are the best teachers, so be sure to listen to them! If you follow the basic principles and guidelines listed above, I am confident that your fall fishing will be nothing short of an overwhelming success! Remember: It is the job of the fly angler to be in the right place at the right time, with the right fly, and the correct presentation! I wish you well, and I hope that you enjoy this beautiful time of year. However, I truly hope that you enjoy the fish of fall most of all! Take care and God Bless!